Since her launch in 1959, Barbie has held the coveted title of most fashionable toy. As one of the world’s most famous style icons, up there with the greats like Audrey Hepburn and Marilyn Monroe, Barbie’s influence extends to many young girls. However, it’s more than just her outfits that Barbie’s young fan base and audiences absorb. Despite holding a pilot’s license and often operating commercial airlines as a flight attendant, between her various career ventures as an astronaut, doctor and Nascar driver – a point which the toy’s manufacturer Mattel makes sure to highlight as it illustrates women can take on a variety of roles in life – the focus is still on Barbie’s design and how her physical appearance conforms to the beauty ideals of Western society. According to the Huffington Post, if Barbie were an actual woman she would be five foot nine inches tall, wear a child’s size three shoe, and her measurements would be a thirty-nine inch bust, an eighteen inch waist and thirty-three inch hips. And it is this unrealistic standard of beauty, exhibited in the form of a role model for young girls, which has caused controversy and sparked uproar over the years. And finally, it seems like Mattel are listening to their critics and opting to solve the representation of women that Barbie portrays. Launching their new campaign, The Evolution of Barbie, the brand is introducing the new 2016 Barbie Fashionista dolls under the slogan ‘imagination comes in all shapes and sizes, that’s why the world of Barbie is evolving.’ The line includes four body types, seven skin tones, twenty-two eye colours and twenty-four hairstyles in a rainbow of colours as well as a wardrobe’s worth of on-trend fashions and accessories Barbie is famous for. These dolls will be released throughout the year. 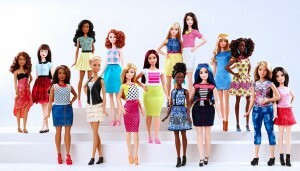 In addition to the 2016 Fashionista dolls, Mattel have also unveiled another new diverse doll. Honouring US footballer Abby Wambach, the doll celebrates the accomplishments of the athlete who has just retired from the game after fifteen years as part of the women’s national team. Helping her team win two Olympic gold medals, the Women’s World Cup championship and having been named US Soccer Athlete of the Year six times, Wambach is also well known for being open about her sexuality. She married her long time partner, Sarah Huffman, in Hawaii in 2013. The doll aims to inspire in many ways, just as Abby does, and the company have stayed true to her look and made the doll with her iconic shaved hairstyle, athletic body shape and football kit.